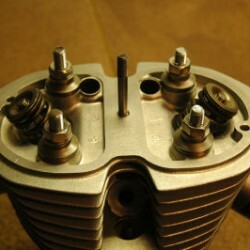 The following method involves bolting the head and cylinder together as an assembly on the bench using all-thread. 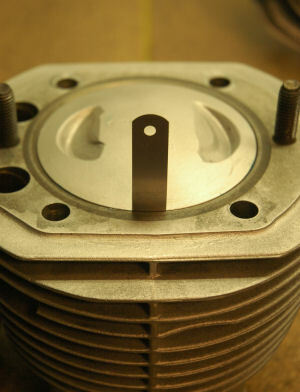 Then carefully placing the piston in the cylinder at exactly where it would be if it were at top dead center (TDC) in an assembled motor. 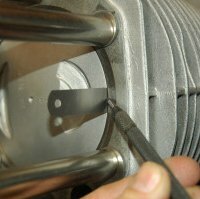 The volume of the combustion chamber (Vtdc) can then be measured directly with the burrette. 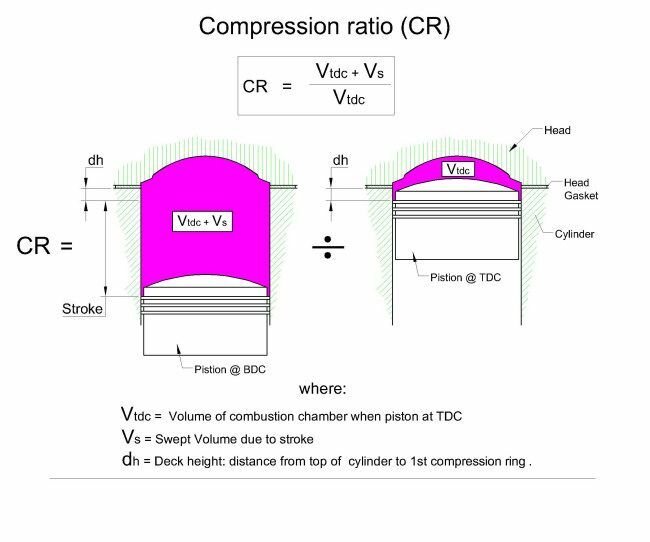 It’s then simply a matter of dividing this volume into the entire volume above the piston at bottom dead center (BDC) to determine the compression ratio as illustrated in the diagram below. 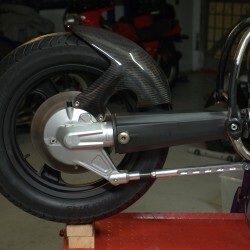 To measure dh, clamp the cylinder to the block using tubes on the studs, turn the motor via the back wheel or an 8mm allen key on the alternator rotor bolt to until the piston is at TDC. 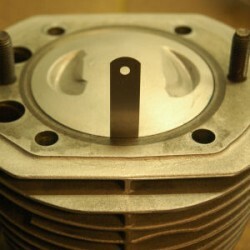 Slide a squared off 0.1mm feeler gauge between the cylinder wall and piston so that it rests on the 1st compression ring. Use a very pointy scribe to mark the top of the cylinder – some prussian blue would be handy here. 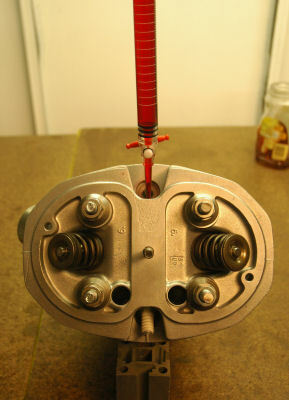 Make sure you slide the gauge in line with the horizontal axis of the gudgeon pin (ie at 3 and 9 o’clock looking directly at the piston) as this is where piston rock is at a minimum. If excising care, you can measure dh with this method to within +/- 0.1mm. Step 2. 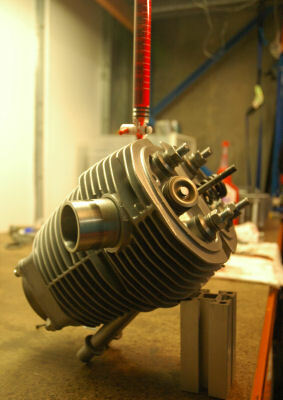 Off to the bench: Move cylinder off the bike and onto the bench then carefully place the piston at TDC using the scribed line on the feeler gauge. Grease the rings a little first in order to make things water tight. 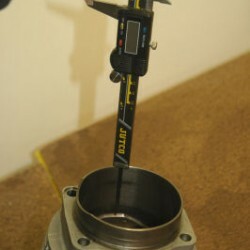 Before bolting everything together, use a vernier caliper to take a checking measurement from the bottom of cylinder skirt to the bottom of the cylinder to give me a means of checking that the piston hadn’t moved position after bolting everything together and buggerising around. Step 3. 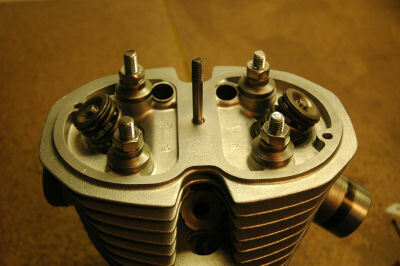 The bench top assembly: Bolt cylinder, gasket and head together using 10mm all-thread then use checking measurement at Step 2 to check that piston hadn’t moved during the bolt up. Step 4. 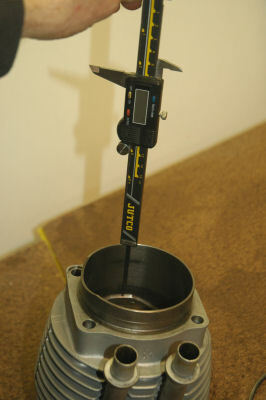 Measuring the combustion chamber volume (Vtdc) with a burrette: If you examine a head you’ll, see that when the plug hole is vertical, a part of the outer periphery of the chamber is higher than the bottom of the plug hole and around a corner a bit like under the lip of a toilet bowl. 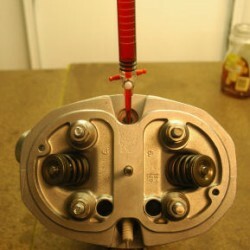 So if you fill when the plug hole is vertical, a sizable air pocket will form at this higher peripheral part. 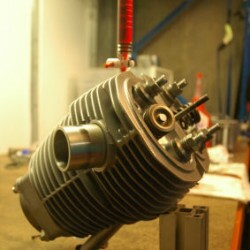 The way to get around this is to first fill to the bottom of the plug hole with the cylinder vertical on the bench. This allows the peripheral volume to completely fill. Then, tilt the assembly so that the plug hole is vertical and continue filling until the fluid level just reaches the bottom of the plug hole. BTW: The burette is the cheaper acrylic type (100ml) and cost me $27.00. Graduations are 0.2ml. (The glass ones are over $100). Use water or metho with food colour or some other means of tinting. 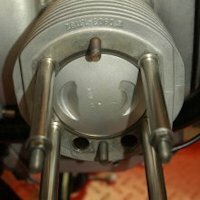 So the final number for my particular R100 BMW airhead? 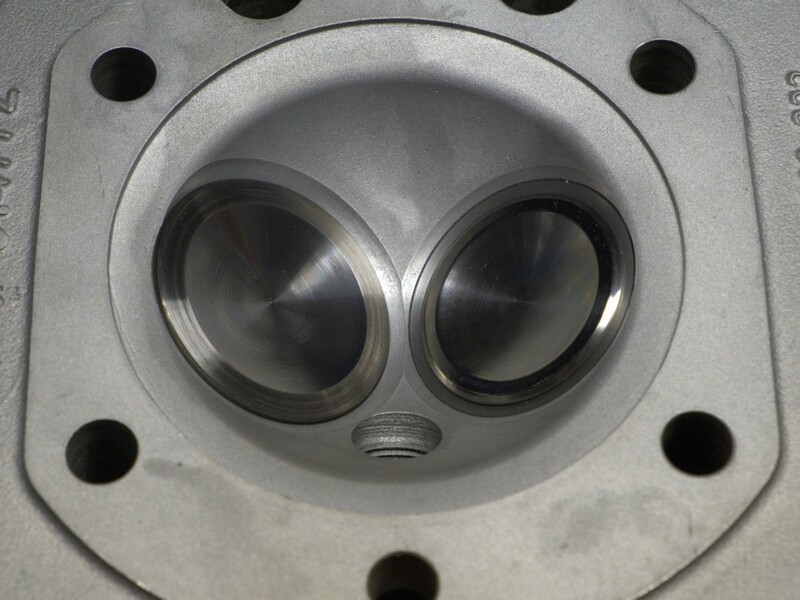 Combustion chamber volume Vtdc = 66.7 cc’s (or ml). i.e. Pi times (bore/2) squared. 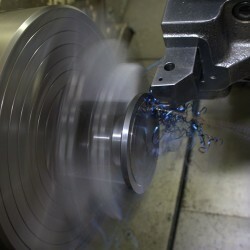 Radius = (bore/2) = 94.25/2 = 42.125. I haven’t done the arithmetic, your CR looks reasonable, your figures are incorrect? Area also equals (Pi x Diam^2)/4 where diameter is the bore. 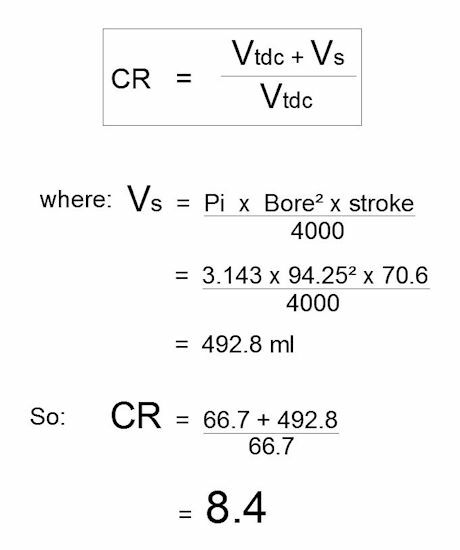 Multiply by stroke and you get swept volume Vs ie displacement which at 2 x 493 = 986 cc’s conforms to BMW spec. Actually, the spec is 980cc’s and the extra 6cc’s in my calc is due to considering the first oversize bore. All looks OK to me.but heck knows, I may have a blind spot..